I figure if Jessica can blog about her garden, so can I. Last summer I grew some basil on my patio. I get only a little bit of afternoon sun, so most anything I’d like to grow (like tomatoes) just won’t work. Today, I finally got down to Coleman’s and got some more basil for this year. They always have so many varieties that I have a hard time choosing. Last year it was Lime Basil. This time I’ve got African Blue Basil. Should be delicious! On the advice of my mom, I also picked up some Fuscia. They are shady loving, so they should do good. They’re the red ones below. 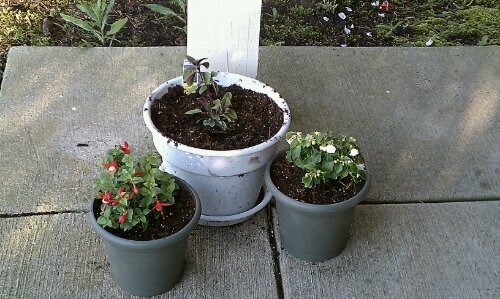 While I was getting some potting soil and pots, I decided to get some white impatiens as well. I still have a bunch of potting soil, so I might need to go back and pick up some more plants. Anyone have any ideas of what I should get? When I end my house-sitting gig, my garden will probably look more like yours. My co-gardener really wanted to try some strawberry plants on her balcony. We don’t get a lot of sun at our place, but managed to grow cilantro, parsley, and oregano last year. The parsley was particularly hearty. The cilantro worked out for a few weeks and then one day just gave up. Try a little more color. White or blue Bacopa likes a little sun but can do well when in shade. There are some trailing vine varieties that might add to your patio pots. some like shade, asparagus sprengeri. Also Coleus don’t mind being shaded and there are several different varieties to chose from. Lobelia, blue or white or combo. Can’t tell what size your containers are but it looks like you could probably add another plant or so to each one. Something else might be some Tahitian Bridal veil. I would suggest if you get another pot to try a 12″-14″ one. (You won’t have to water as often as you will with smaller ones.) In a 12″ pot you can probably place 3 or 4 different plants in the pot. Be creative, just make sure the plants have the same watering habits.